Because Robert Bosch needed to build excitement and brand awareness for its new line of cordless tools in the professional market with a smaller budget than its key competitors, Robert Bosch turned to Chicago creative agency, The Ungar Group for help. We created a torture test between Bosch, and its leading competitors: DeWalt, Milwaukee and Makita. 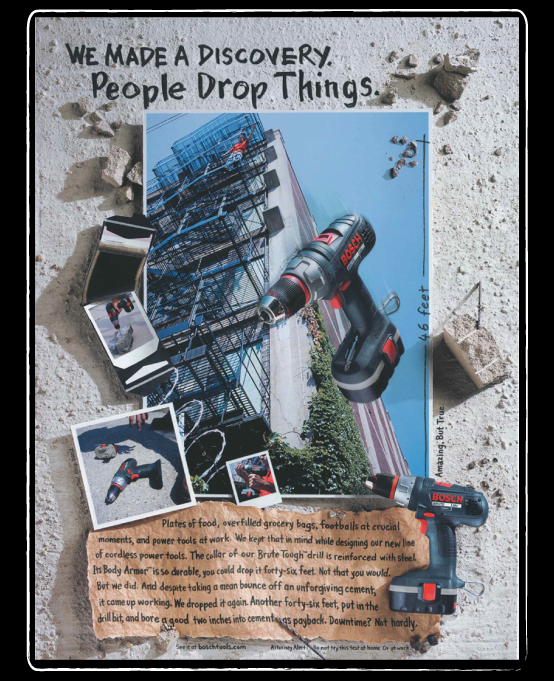 This was the foundation of a multi-platform new product launch that included radio, construction site demonstrations, online, out of home, trade shows and guerrilla marketing executions. As a result of the new campaign from the Chicago creative agency: DeWalt, the category leader, scrapped its marketing strategy, while distribution for the new line of Robert Bosch professional tools exceeded sales projections by 37%.